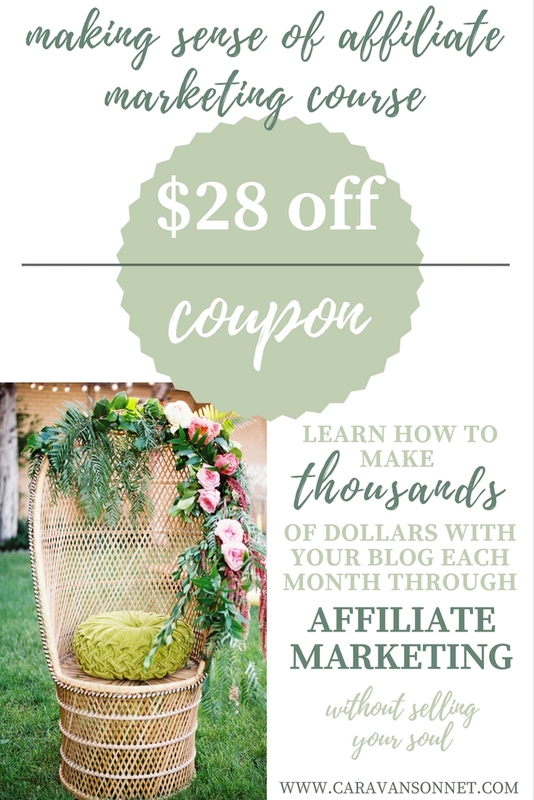 Grab your Making Sense of Affiliate Marketing coupon: Use the code MAY28 when checking out HERE. Coupon expires April 16th at 11:59pm. Bloggy World friends- This post today is specifically for YOU. I don't always write a ton about blogging here on the blog, but I do get asked about it A LOT. Today, I wanted to share with you the reason that I decided to invest in Michelle's class "Making Sense of Affiliate Marketing". I had seen this class floating around blog world for a long time and around Pinterest. I really debated on purchasing it though as I had never ever spent a ton of money into blogging courses in the past. At the same time though I was impressed with the description of the class and also have been looking into ways to bring more income. 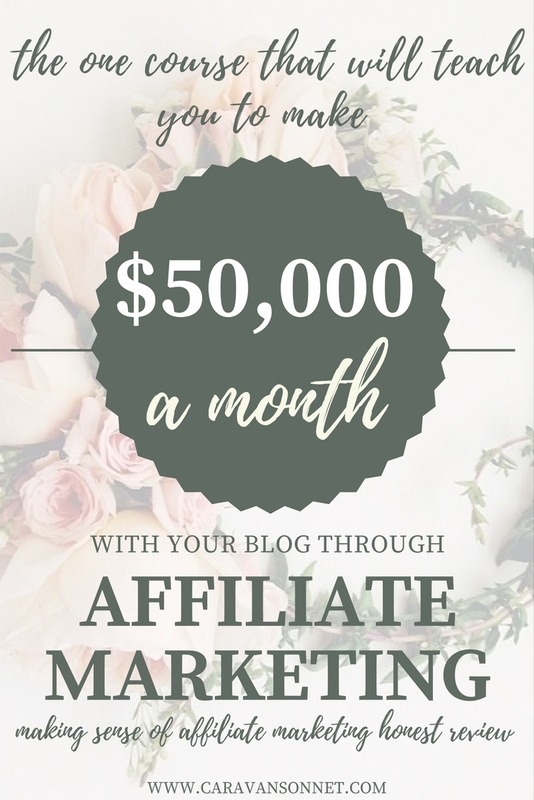 I loved the fact that this class allowed me the freedom to grow as an affiliate marketing blogger without changing my blog mission. So today I am so excited to share about the class because for the next few days ONLY Michelle's class is $28 off and this is a deal that does not come around that often. Listed below are some of the most popular questions that I have received about the class and I hope that it will help answer any that you may have. Let me know if you have any questions! I am happy to answer them! This is probably the question that I get asked the most and the question that I have seen floating around all different blogging groups. If you don't already know Michelle Shroeder-Gardner is the designer and creator of the popular course, "Making Sense of Affiliate Marketing". Michelle is a genius blogger and is the writer behind her blog Making Sense of Cents which earned her almost a million dollars last year in revenue. Yes, you read that correctly. As a blogger she brought in almost a million dollars. When I read through her income reports I was immediately shocked and intrigued. I had heard of other courses that discussed affiliate marketing, but had no where near the numbers of revenue that Michelle has. In this online course Michelle shares all of her secrets and methods which have allowed her to earn over $50,000 in affiliate marketing (or as she describes it, passive and consistent) income EACH month. The cost of the course is $197 if you pay the one time fee (which today through April 15th you can receive $28 off by using the code MAY28 - making the cost ONLY $169- click HERE) or two payments of $105. If you are like me than you probably are wondering if it is worth the investment... especially if you are like me and you are not making that much money (I was making less than $4 a month in affiliate marketing sales before I took the course) and the thought of investing into the blog this substantial cost is overwhelming. When I first purchased the course I almost immediately asked for a refund. THANK GOODNESS I DIDN'T. I thought I knew everything about affiliate marketing from reading things on line and all of the research I was doing. Y'all I wasted so much time and so many hours, but they were completely redeemed in purchasing the course. It is one of THE best decisions that I have ever made for my blog and it will be for yours too. Before I purchased the course I didn't really understand what Affiliate Marketing was. I had this mis-conception that by diving into the world of Affiliate Marketing I would be "selling my blog out". What I learned about Affiliate Marketing (in my own google search) didn't really share with me how to correctly implement the information I was learning for me or my blog, and especially not for my audience. As I worked through the course I was hit by strategies that were amazingly easy to implement and even if the information may not have been completely new to me, the way that Michelle explains things has changed the way I have come to think of affiliate marketing. I now see Affiliate Marketing as making me a better blogger and a better writer. It has connected me more deeply with my audience and as I went through the course and started to implement ideas that I was learning and have continued to do so I have grown as a blogger and a creator. The course has challenged and encouraged me to dream big on this little space- not about money, but about following a dream and a passion that you may have. Beyond the encouragement and dreaming big, financially and practically this course has changed things for me. As I mentioned above I used to make less than $4 a month in affiliate marketing and I have now changed that by over 5000 PERCENT in the first month and AND GROWING each month!!! Y'all this has been HUGE for me. Having the opportunity to earn money- passive affiliate income has been a GAME CHANGE and has been some of the easiest cash that I have ever made on this blog. Other bloggers have had HUGE successes (you can read about them on the course page) and who knows what YOUR 30 days could look like!! A 30 day refund policy. 2. A Facebook group where Michelle regularly interacts with members and everyone is incredibly supportive. A full list of bonuses can be found on the course page. Who is the course good for? -You want a course that teaches you the very basics and then builds from there. -You are an affiliate marketing beginner, and want to start monetizing your site. -You have affiliate marketing knowledge, but don't know how to put a strategy together for your blog. -You have begun using affiliate links but aren’t making any income. Do I need a lot of page views before this course is worth it? While lots of traffic will increase your affiliate marketing success, I was pleased and shocked to realize and learn that it is not the only factor to affiliate marketing success. There are TONS of blogs that will get lots of page views but don't have conversions. More importantly this course teaches you to get into the mindset of an affiliate marketer and how to be strategic with the content you produce - no matter your page views. Is this course niche specific? NO. This course will teach you the building blocks for success no matter your niche. It will give you a road map and foundation for success. Do I really need this course? Can't I find free information on the Internet? My honest answer is maybe. If you want to spend hundreds and hundreds of hours reading through and researching you may be able to find some of the information on line. BUT you wouldn't have all of the in-depth knowledge, the information collected and presented in an easy to understand and implement way and you wouldn't have all of the bonuses that I have shared above and more. The course in these ways and more is priceless. This course completely changed my blogging life, and gave me the final push I needed to make affiliate marketing work for me. This course was the last missing piece of the puzzle for me, and I do honestly believe that it will be for you too. If you’re unsure or worried about the cost, than the 30 Day refund policy is a complete gift. Purchase the course, put the work in, see the outcomes, and then decide whether or not to ask for a refund. Very very simple. Do you have any questions? Please feel free to ask in the comments if you have any further questions, and good luck in your affiliate marketing journey friends! I hope that you will find it as rewarding as I am!! Don't forget = the sale ends SOON so go and purchase today for $28 off using the code MAY28 and click HERE to purchase. You increased your affiliate income to $20,000 a month?! Did I read that right?! NOO I wish! I would be shouting it from the rooftops! 5000 percent from four dollars!! So the first month I brought in about $200 in affiliate marketing only and then it has been growing in the last two months like crazy!! I am going to edit to make that more clear RIGHT away. Sorry for that confusion!!! hahaha I WISH and dream and hope!! !